Sonoma State University has received a $2 million bequest from an anonymous donor for its Osher Lifelong Learning Institute (OLLI) program. This remarkable donation will effectively double the program's existing endowment. It also represents one of the largest gifts made to any Osher Institute across the nation. "I want to share this program with everyone and hope that my gift and my passion for OLLI will encourage others who want to expand their horizons to dip their toe in and give it a try," said the donor, who has lived in Sonoma County for decades. "This is truly great news for Sonoma State, for the OLLI program in particular, and for the growing number of older adults in Sonoma County who want to keep learning and choose to do so at this university," said Sonoma State University President Judy K. Sakaki. Now in its 16th year, Sonoma State's OLLI was the second lifelong learning institute to receive support from the Bernard Osher Foundation. There are now 120 lifelong learning programs funded by the Foundation, and Sonoma State's institute is one of the largest and most academically rigorous. 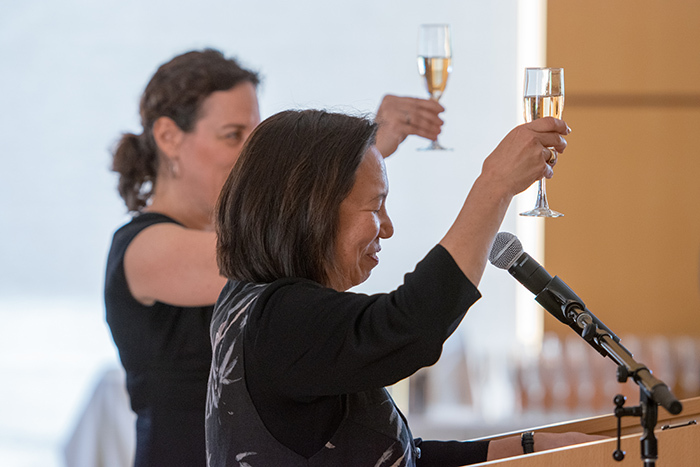 "This munificent legacy gift will create abundant and exciting academic and social opportunities for generations of lifelong learners," said Sonoma State OLLI Director Carin Jacobs. "As a self-support program that receives no financial investment from the State, OLLI relies largely on private annual and estate gifts like this. There are no words to express the magnitude of my gratitude." Mary Bitterman, president of the Osher Foundation, saluted the anonymous donor. "This gift will provide inspiration to other Osher Institute members throughout the national network to provide for the long-term sustainability of their respective programs," she said. "Sonoma State's Osher Lifelong Learning Institute has been a trailblazer in several regards and this extraordinary gift is but another example of the leadership provided by individuals in the Sonoma community. We join with the University in expressing our appreciation to the generous donor." Sonoma State's OLLI program has an annual budget of $400,000. It is currently supported by member fees, donations, and the earnings on a $2 million endowment generously provided by the Osher Foundation. "The Boomers are coming to class in growing numbers, and Gen X is right behind them," said Jacobs, noting the aging national and local population. "This bequest will allow us to grow and adapt to meet the needs of these new generations of OLLI students." Osher Lifelong Learning courses are open to all persons age 50 and above at its Sonoma State and Oakmont campuses. Ninety-five percent of OLLI students have a college degree, 50 percent have an advanced degree. OLLI classes do not have tests, grades or homework, and instead focus on learning for the joy of learning. Former Sonoma State University Provost Bernard “Bernie” Goldstein, a pioneering professor at San Francisco State University in the field of human sexuality, passed away on April 27. He was 82.